Abby Wambach, U.S. Women's Soccer Star, Retires : The Two-Way Shortly after Wambach and the rest of the World Cup-winning U.S. national team were honored at the White House, Wambach announced her plans to retire from soccer. 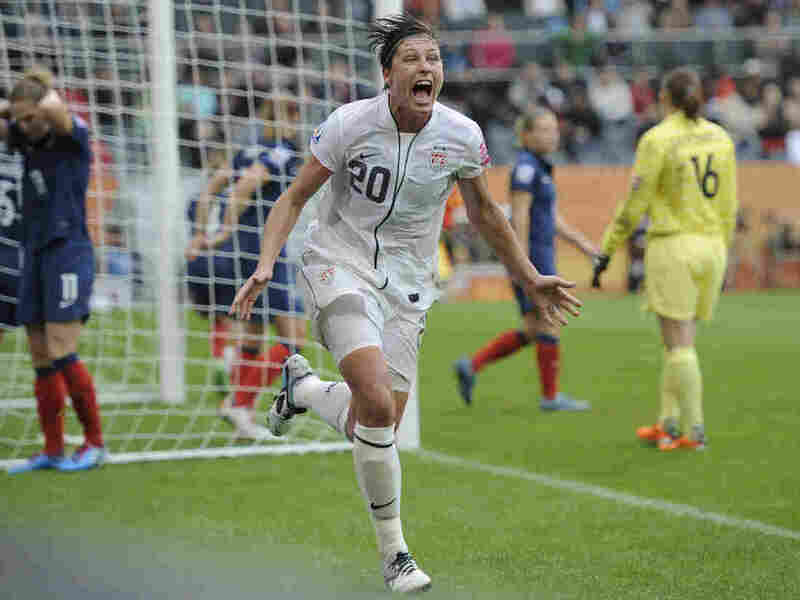 In this photo from July 13, 2011, Abby Wambach celebrates scoring her side's second goal during a semifinal match against France at the Women's World Cup in Germany. Wambach, the leading career scorer, male or female, in international soccer, announced her retirement from soccer today. After celebrating the U.S. women's national soccer team's 2015 FIFA World Cup victory at the White House today, veteran Abby Wambach, 35, announced plans to retire. Wambach, who is the leading international scorer for both men and women, said she will step away from the game after the team's the final four games of thier victory tour. The match against China in New Orleans on Dec. 16 will be her last match. "After much deliberation and talking with my friends, family, teammates and our coaching staff, I've decided to finally bring my soccer career to an end," she said in a statement according to ESPN. Wambach has appeared in 252 international matches and has scored 184 goals. While honoring the team at the White House earlier today, Obama alluded to Wambach's "dominance," her long career, and her impact on the world beyond soccer. "Abby said that she wanted her final World Cup to be like a fairytale. And I'm not sure she could have written a better ending: a world champion at last, draped in the Stars and Stripes, showing us all how far we've come — on and off the field — by sharing a celebratory kiss with her wife," Obama said. Wambach has also been an advocate for women's soccer and women's sports in general. "While we still have more work to do for women's soccer, after bringing the World Cup back to the United States this summer, I'm feeling extremely optimistic about the future of our sport. It's been an amazing, wonderful ride, and I can't wait to see what the next chapter of my life brings," she said in the statement.